A talk on the restoration of the garden at The Manor House, Upton Grey, designed by renowned garden designer Gertrude Jekyll, was the focus of our fundraising lunch held on Monday 23 March 2015. 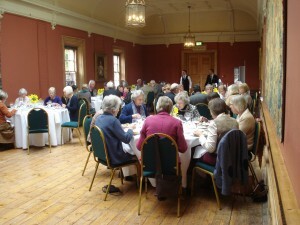 The location of the lunch was the beautiful Long Gallery at Englefield House near Reading in Berkshire, by kind permission of Zoe Benyon. The event started with a tour of the church on the Englefield Estate before our 60 guests arrived at the Long Gallery for a canape and bucks fizz reception, sponsored by Tony Roe Solicitors. The delicious lunch of herb marinated supreme of chicken in a lemon and tarragon sauce followed by tarte tatin was then served. During coffee and hand made chocolates Rosamund Wallinger gave an amusing illustrated account of the history of garden design and Gertrude Jekyll’s life before telling us about her restoration of the garden at Upton Grey, together with all the trials, tribulations and lessons experienced along the way. Finally, a prestigious raffle with a variety of high quality prizes donated by local companies, including a two-day sculpture course by McAlistair Hood of Englefield Garden Centre, was drawn. The event concluded with the guests enjoying the gardens at Englefield House, bathed in gorgeous Spring sunshine. We would like to thank all of our supporters who made this special event so successful. After graduating from her MA in Womenswear from the Royal College of Art FfW grantee, Camilla, was selected as one of eight finalists of the H & M Design Awards and was flown to Stockholm for an exhibition and catwalk show. At the show Camilla’s knitwear was judged by fashion and celebrity judges including actress Michelle Dockery from “Downton Abbey” and two fashion editors from “Vogue”. Camilla’s collection takes inspiration from the dystopian vision of the future found in the 1988 movie They Live, resulting in graphic metallic knits matched with fuzzy knits inspired by white noise. Camilla is now working as a Design Assistant for a knitwear supplier who supplies high street stores such as Monsoon, Top Shop and Dorothy Perkins. Our AGM on 11 June saw members present say farewell to Gillis Burgess, who retired from the Board of Trustees after 41 years service. Gillis cut a cake before sharing a cup of tea with friends. We were also pleased to welcome three interesting speakers – Victoria Lenzoi Lee, Dr Pam Hirsch and Sarah Rhodes – who spared the time to tell us about working with the Design Council, the recent BBC programme “Shopgirls – the true story of life behind the counter” and collaborating with communities in Africa to design jewellery. To read a full report on our AGM and the three presentations please visit the News items below. 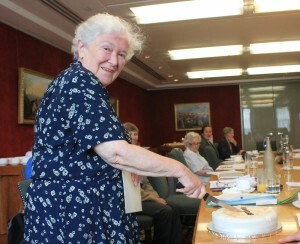 Gillis Burgess cuts her farewell cake. 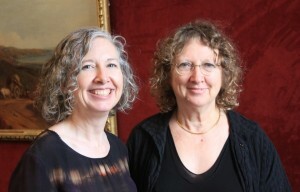 Sarah Rhodes (left) and Dr Pam Hirsch. 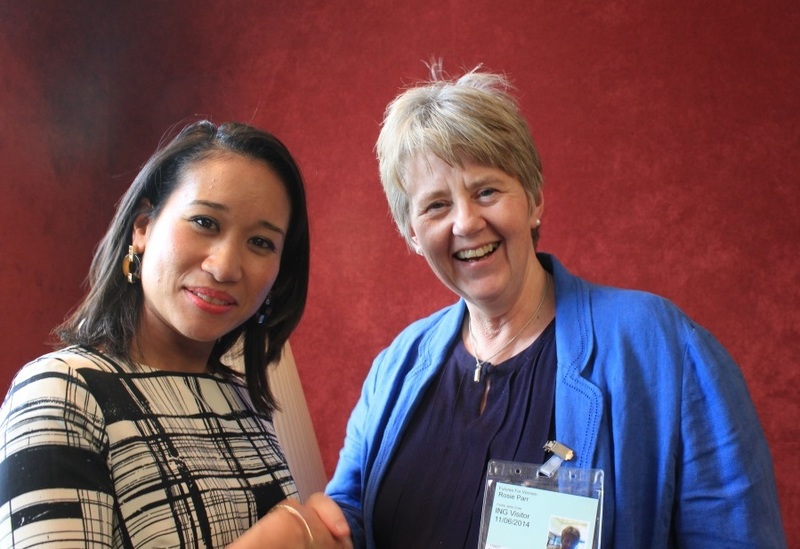 Our 2014 AGM was held on 11 June when over 30 Trustees and members met at ING Banking in London who, once again, provided complimentary meeting space and refreshments as part of their support for the work of FfW. Following the formal meeting we welcomed three speakers. Firstly Dr Pam Hirsch, who is a Lecturer in English Literature; and Film History & Theory at the University of Cambridge and member of FfW, gave everyone an update on being interviewed for the BBC2 programme “Shopgirls – the true story behind the counter”. Dr Hirsch was featured on the programme on 24 June 2014. Members were informed how, in 1862, FfW founder Jessie Boucherett argued that there were far too many governesses and dressmakers and women should consider other areas of employment, such as saleswomen in shops. However, there were many objections to the employment of women in retail, including the belief that they would not be able to stand for the required number of hours and that ladies disliked being waited on by ladies! But Jessie Bourcherett believed that the main obstacle to the employment of women in shops was their ignorance of accounts, as in many schools girls were not offered the opportunity to study arithmetic. There was also a lack of public conveniences for women which impacted on their ability to become independent from the home. Jessie established the Society for the Promotion of Employment for Women (now Futures for Women) and was one of the pioneers of the women’s movement in the nineteenth century. The second presentation was from Victoria Lenzoi Lee, an ex-grantee of FfW who is now employed as a Design Adviser by the Commission for Architecture and Built Environment at the Design Council. Victoria told members how she helps to ensure that sustainable communities are created through good design practice via collaboration with key stakeholders. Victoria’s role is particularly crucial in light of recent plans for growth, such as London’s 2020 vision. Finally current grantee Sarah Rhodes, who is studying for a practice-based PhD, brought along some of her hand-made silver jewellery that is inspired by the African culture. Members heard about how Sarah is working with communities in Africa to ensure that there is true collaboration between all parties involved in the process. Everyone present agreed that the diverse presentations had all been fascinating and the three speakers were thanked for sparing the time to join the meeting. At our 2014 AGM on 11 June the Trustees and members present said farewell to Gillis Burgess, who has been a Trustee of Futures for Women (and SPTW) for forty-one years and is also an ex-Chair of the Board. Gillis has decided that now is the time to retire from active duty although she remains a member of the Society and will continue to be a supporter of our work. After announcing Gillis’ decision to retire from the Board Chair Elspeth Richards gave a vote of thanks to Gillis for her fantastic devotion to the work of FfW. Elspeth Richards said “I first met Gillis in the early nineties. She was chairing a meeting of Trustees. I was impressed by her clear thinking, plain speaking, excellent diction, and her air of authority. This was a charity I felt was well managed and I wanted to join it. “Gillis became a Trustee in 1973, vice-chair in 1989 and chair in 1993. She was a real asset to SPTW as we were then. She brought considerable administrative experience from her work with the PCAC. Her knowledge of the antiquarian book trade proved invaluable when it came to reorganising our archives. Because of her work our charity was able to hold Trustee meetings at the offices. Anyone who has tried to hire a meeting room in London will know what a benefit that was to our funds. “Our charity, founded in 1859, has a rich historical archive. When Mrs Golding, Secretary for 50 years died it was Gillis who organised the removal of the files and records from Mrs Golding’s home to the offices of PCAC thus preserving our archives. These documents are now held at Girton College, Cambridge, where they are often consulted by students and historians as they contain fascinating details of women in the workplace from Victorian times onwards. Gillis organised a bursary for a research student to examine the archives. That student, Dr Anne Bridger, is here today and she with Ellen Jordan, co-wrote our history ‘Timely Assistance.’ And what a benefit that has been for us and for many students. Following the Chair’s vote of thanks to Gillis all members present shared a cup of tea and farewell cake. The work of Futures for Women and our founder Jessie Boucherett will feature in a new BBC2 programme named “Shopgirls – the true story of life behind the counter”. FfW member, Dr Pam Hirsch, who is who is a lecturer in English Literature, Film History and Theory at the University of Cambridge, was interviewed by the production company and spoke about the work of Jessie Boucherett and how she established the Society for Promoting the Training of Women (now named Futures for Women). The interview will feature in the first of the series of “Shopgirls” which will air at 9.00pm on BBC2 on Tuesday 24 June. The series will run for three weeks. There will also be a book published to accompany the programme. 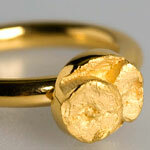 You can find out more about “Shopgirls” by visting the BBC website. The first few months of 2014 have been a busy period for Futures for Women. You can read all about an exciting forthcoming BBC programme featuring our founder, Jessie Boucherett, and the current activities of ex-grantees in our latest newsletter. Our Trustees were once again impressed with the quality of potential grantees short-listed for interview on 18 March 2014. Firstly we met a jewelry designer who is in the final year of her practice-based PhD and saw some examples of her African-inspired work. We then heard from a young woman who will be studying an MA in Critical Theory at the University of Sussex. The candidate who will be studying Russian at the University of Oxford gave us some background information on the current situation in Crimea and finally we met a woman whose career ambition is to work for the United Nations on international development issues. On 14 January 2014 the Society for Promoting the Training of Women officially changed its registered name to Futures for Women following acceptance of a members’ resolution proposing the new name. We will continue to use the name Futures for Women – the work of SPTW on all stationery to acknowledge the history of the charity. Futures for Women has been used as a working name for 6 months and was widely accepted by our supporters and members alike. The name change was proposed by a strategy group to better reflect the work of our charity today. Wednesday 20 November saw our Board of Trustees meet 5 candidates short-listed for interview following their application for an interest-free loan to help them with their educational fees. All of the Trustees were very impressed with the quality of the candidates and were interested to hear how these women are striving to become lawyers, a university lecturer, an industrial designer and a socio-political journalist. We applaud all of these women for working so hard to achieve their career ambitions and congratulate them on reaching our short list stage.